Supermarkets here employ less staff, they have provided a large 'self-serve' area with many cash registers where you scan, weigh & pay for your goods yourself, all under the watchful eye of ONE employee, apparently theft is huge & growing! i will NOT have any part of more people losing their jobs & i have told them so! And besides if they want me to do the work of someone that's lost their job then i want a sizable discount!!! Well that's not going to happen, i mentioned it & got CRICKETS!!! Technology is fine. . ..so what happens when it goes wrong, and who is around to fix it. . . and don't forget the tolerance and patience levels of ordinary people which has declined because of the instancy and immediacy of fast technology. Let's hope some of the jobs can be saved by increased customer service personnel. No matter how much people want to blame Trump for everything, this really comes down to individual companies. Unfortunately, most owners are willing to do whatever it takes to make the most profit, even if it means worse customer experiences. So if the technology exists and is available/affordable to them, they will take it. Those automated machines hate me, I refuse to use them. I have done self check out a couple times, but there is nothing like dealing with a live human being. If you have a problem, the machine can't help you, but another person can. I intensely dislike the automated check out. I have a prices come up that were considerably higher than advertised prices....and who do I have to complain....one time no one. I had send an email to the corporation to complain. I received many coupons and discounts in response but I could have been cheated and I know others less attentive...and not on fixed incomes....are cheated. Thank you, Judy, for this posting. I think more people should do as you and I do Animae. They did the same thing here a huge area of self check out and one or two cashiers. I wait in the line and have complained. I feel badly on those older than myself or with disabilities. Is hard for them to stand in the longer and longer lines. I make it a point to look at the people checking out their own items and say, glad you like to be their unpaid employee. Someone has lost a paid job by you doing it for them for free. 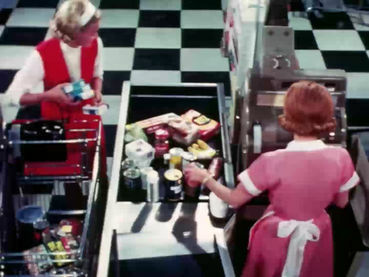 This affects many women's jobs as most cashiers tended to be women. A lot of older workers have had to return to work as social security is not keeping up with the prices and they tend to become cashiers. Now it is one less place that they can find to increase their meager income. Job churn has always been with us. Not much call now for buggy whip makers, coal stokers for steam engines, or stenographers. Ferrymen tried to destroy new bridges over rivers that would end their livelihoods. The difference is the speed of job turnovers. My concern is with our education and training - Betsy De Vos will eliminate any critical thinking and creativity necessary to dream up new jobs. The bright side is an upsurge in and appreciation for craftspeople and bespoke services. I do not even like to use an ATM for banking so would be really lost trying to do my grocery shopping checkout. I think the idea is for a cashless society also so we are completely controlled. I went into a branch of Halifax yesterday to deposit a cheque for my mother into her account, and was asked whether I wanted to use their automated system, and I replied, "No, I prefer to engage with humans." I can understand these companies using automated systems. Ii is very rare that you find people who are prepared to work hard, not like in the olden days.